Quilts of Valour are quilts being made for injured military personnel on their return to Canada. As of December 2010 they delivered over 1300 quilts to our injured service members and to veterans. We met Lezley and Alison at ‘Quilt Ontario’ in London today. 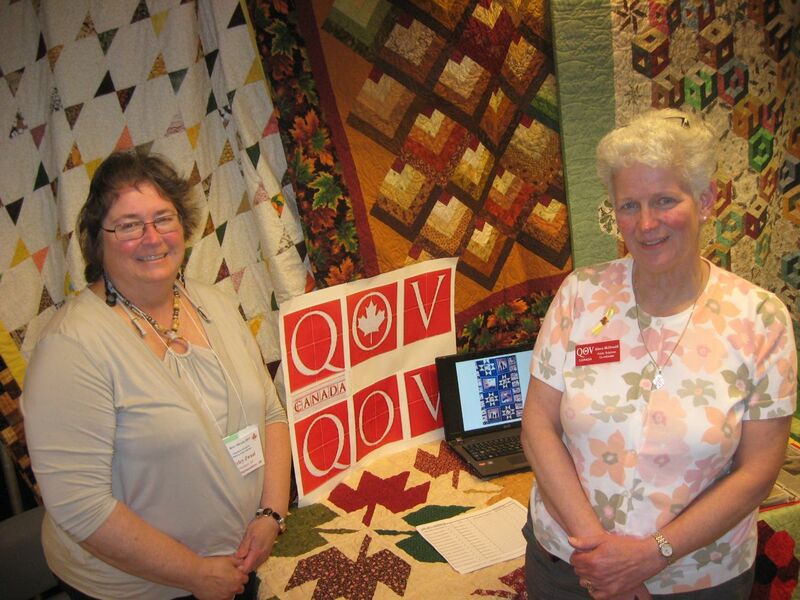 Lezley Zwaal, Founder, Quilts of Valour, and Alison McDonald, southwestern Ontario representative. QoV’s mission is to ensure that our injured Canadian soldiers are recognized for their bravery and commitment of their true patriotism to our country. Make a quilt for our soldiers and veterans and QoV Canada will deliver it. Quilts go to our armed forces bases, rehabilitation hospitals and veterans homes right across the country. They don’t know who will receive the quilts but they love hearing from the soldiers and knowing the quilts are received and treasured. Posted on June 1, 2011, in Quilt block patterns., Quilt Blocks. and tagged injured military personnel, Quilts of Valour. Bookmark the permalink. Leave a comment.